While Workshop Butler provides full-featured customizable registration pages for workshops, there are many reasons why you may use other tools to gather info about the participants of your events. 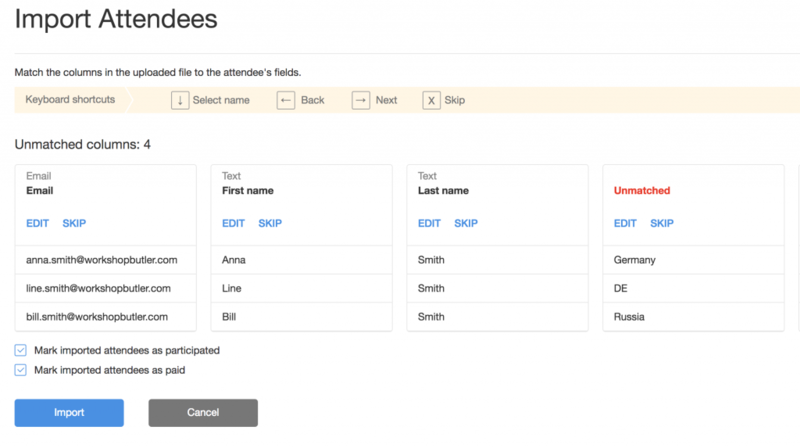 To simplify the process of adding the attendees manually, you can import them. There are two ways to start importing attendees. You can either click on Import from CSV file link right on the Attendees tile or push Import attendees button on the list of event attendees. the columns should be separated by commas (,). Other separators are not supported. When the file is uploaded, you can match the columns. Each record must contain at least three columns: first name, last name, and email. All other attributes are optional. Workshop Butler tries to match these columns automatically. You need to match other columns manually. Hint: Use a keyboard for faster matching. You can match data to both system attributes (Country, VAT Number, Phone) and custom attributes from registration forms. country (for home, work, and billing addresses) must be either a two-letter country code or a valid country name in English. Letter capitalization doesn’t matter. The platform sees DE, de, Germany, germany, GERMANY as equals. It is possible to import ticket data. For that, you need to add ticket types to an event first. Records in CSV file should contain price without currency. For example, you added a Regular ticket type for $1300. A Ticket column in CSV must be 1300 for a successful import. The platform is clever enough to understand that 1300 and 1300.00 are equal numbers. The platform automatically detects which ticket type should be assigned to which attendee. If you have several ticket types, and import attendees with different paid amounts, Workshop Butler handles it. If it is not possible to identify, what ticket type should be assigned to an attendee, the price is recorded as Custom amount. If it’s possible to generate certificates for an event, a checkbox Generate certificates for all attendees appears. If checked, the platform generates and sends certificates along with a post-event message to each imported attendee. Generation of certificates may take some time. If you import the attendees and see no certificates along with their names in the list of attendees – do not worry. Give it a few seconds and refresh the page. 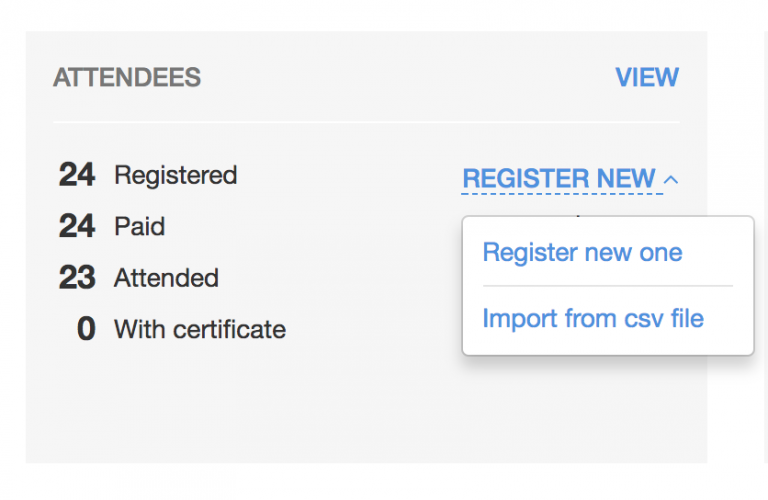 Do not forget to click Import button for initiating the process of importing attendees.